Wow! Yesterday after many years of looking at this orange and black box of toothpaste, I decided it must go home with me! Away we went! Fresh breath immediately. A little history is a part of this toothpaste. It was made in Porto in 1932, and was first called ”Pasta Medicinal Couto” by Alberto Feirreira do Couto. He made this formula with his friend who was a Stomatologist. It was originally formulated for receding gums. Many older people in Portugal use this as it is a well known formula, and a family business. 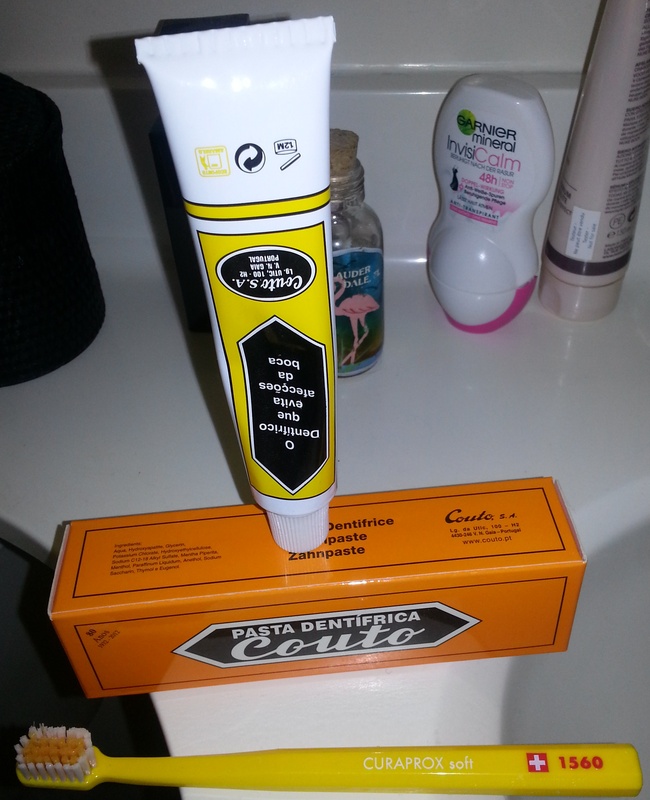 Couto Toothpaste is highly recommended for dental hygiene and daily use. Couto toothpaste helps your gums and fights against cavities. Make sure when using to massage your gums while brushing your teeth, and penetrate that interdental space. Leave on teeth for a few minutes before rinsing. Brush your teeth upon waking up, before going to sleep and after meals. The taste and freshness of Couto toothpaste is minty delicious!